Bunner's Bake Shop - Eat. Sleep. Vegan. This post originally appeared on Mmm, Tasty! Toronto bakeries and coffee shops take note: you can make wonderful baked goods that are both gluten-free and vegan. As someone who adheres to both of those diets, it can be very difficult finding a snack if I’m at a cafe with Rich on a lazy weekend afternoon. Toronto has a lot of choices for vegans, and a lot for gluten-free people. There are even places that advertise themselves as being both gluten-free and vegan. However, I’ve always found that they don’t mean both gluten-free and vegan, they mean either gluten-free or vegan. I’ve been disappointed by this every time. It’s not that I don’t understand how tricky it can be to bake things with both of those diets in mind – believe me, I’ve had my fair share of failed kitchen experiments learning to navigate my way through gluten-free, vegan baked goods! But I also know it can be done. And by the strong success of Bunner’s Bake Shop, I’d say there is demand out there for this sort of thing. The story behind Bunner’s is a bit of a small business fairy-tale: Girl meets boy. Girl and boy decide to open business together, selling their baked goods in the Distillery District last summer (after doing a lot of research and coming up with a business plan). Their vegan, gluten-free products became so popular that they usually sell out by the end of the day. Girl and boy advertise on the Toronto Vegetarian Association’s directory, and start getting tons of calls from people asking about their products. Girl and boy decide to open a bake shop and find a cute little space in the Junction. Now they’ve got their products in a few cafes all over Toronto and still nearly sell out at their bakery location every day. As for my trip to visit them? Well, yesterday Rich and I finally make the trek up from Keele station (which we’re at every Sunday anyway) and popped in to see what they had. We were greeted with a huge smile and chit chatted about the beautiful weather and the products behind the counter. We decided to get a cupcake in every flavour they had available, plus one of their Creamies (for Rich) and Supersonic Gypsy cookies (for me). Verdict? Oh. My. God. The Gypsy cookie was perfect; if I wasn’t afraid of gaining a ton of weight I’d eat one daily. It was packed to the brim with oats (certified gluten-free, of course! ), seeds, cranberries and chocolate. Not too sweet and nice and filling. Rich’s Creamie, which is two chocolate chip cookies sandwiched together with chocolate or vanilla icing, was really great too. The bite I had was tender, sweet and very chocolatey – if I had ordered it, I probably would have only eaten half in one sitting, as it packed a real sugar punch. The four we managed to snag were vanilla, coconut, lemon and red velvet. 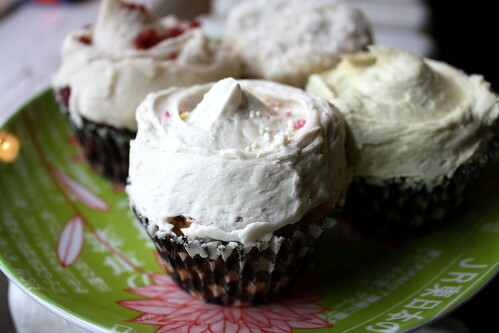 Now, I’ve made my fair share of gluten-free, vegan cupcakes, and friends have always given my attempts a thumbs up. I know a big part of the secret is finding the perfect blend of flours, to try to mimic regular flour as best as you can, giving it a light crumb without allowing your product to become a crumbly mess when someone tries to eat it. You have to be a bit of a chemist to pull this off – a bit of extra protein here, a bit of starch for lightness there, something to bind the ingredients together in the absence of gluten, all while making a good tasting final product. Bunner’s product really blew me away. They use bean flours but I couldn’t taste any ‘beaniness’ at all. 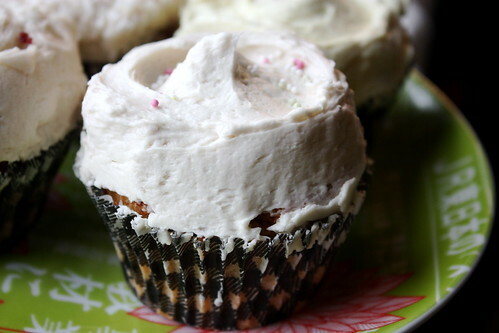 The cupcake came out of its paper liner really easily but didn’t instantly fall apart. And the flavours are fantastic – red velvet lightly chocolatey and sweet with a hint of ‘cream cheese’ (vegan, of course) from the icing. Lemon tasting like real lemon and not lemon candies. Coconut and vanilla also wonderful, even a day old (we’d saved them for today). Please, do yourself a favour and check this place out. It’s worth the trip into the Junction if you don’t already live near there – there’s a reason they were voted best new bakery for 2010 by BlogTO! You don’t have to be vegan or gluten-free to appreciate tasty baked goods, right? Bunner’s Bake Shop, 3054 Dundas Street West in the Junction, 647-352-2975.